Mr. Mullings currently serves as a Managing Director of The Collingwood Group, a business advisory and risk management firm focused on the financial services industry, since 2015. Mr. Mullings has a 40-year career in the mortgage banking sector. 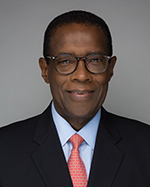 From 2005 to 2015, Mr. Mullings served as a Senior Vice President of Freddie Mac in the Single Family Business division. While at Freddie Mac, he also served on the Operating, Management and Credit Risk Committees. Prior to joining Freddie Mac, from 1997 to 2005 Mr. Mullings was a Senior Vice President at J.P. Morgan Chase & Co. in the home finance area. Previously, Mr. Mullings was the President and Chief Executive Officer of the Mortgage Electronic Registration Systems, Inc. (MERS) and the President and Chief Executive Officer of the Residential Mortgage Division of the First Interstate Bank in Los Angeles. Mr. Mullings received his Overseas Certificate in Business Studies from the College of Arts, Science and Technology in Kingston, Jamaica, following which he became a Member of The Institute of Accounting Staff in conjunction with the Association of Certified Accountants in London, England.